Easy - to - adjust impact force. Automatic compensation for different work piece thickness ( note : Airline Pressure is only compressing the spring - not for determining impact force). Highly versatile : Ideal for LIGHT ASSEMBLY WORK and for SHEET METAL WORK (Riveting, flaring, Piercing, Shearing, Bending ..... plus many more operations). Output speed matches speed of manual loading. Lowest rejections - even in precision jobs. Far longer tool / die life ! Adaptable for automation with approximate fixtures tools and dies. Tools with cylindrical shanks are clamped by a collet in tool-holder. Arm can be set and clamped at any height on the column. Fine-ground working table surface with T-slots for speedy iing of work - holding ixtures. 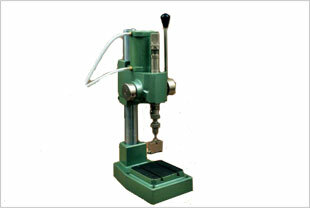 All sliding parts are made of selected steel hardened and ground.